To schedule any of our cleaning services, or to answer any questions you may have, please call us today at (630) 543-0668. Credit cards accepted. Bundle services and save! Our goal is to exceed your expectations. We guarantee your satisfaction 100%! 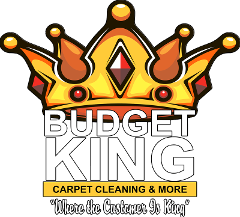 Thank you for visiting Budget King ... "Where The Customer Is King!" We look forward to the opportunity to earn your business. Save even more money now! CARPET CLEANING & UPHOLSTERY SPECIAL! - 5 rooms steam cleaned and deodorized with sofa, loveseat and chair $114.95! NOTE: Visibly soiled fabrics will require pre-conditioning. AREA RUG CLEANING OFFER! - SAVE 50% on area rug cleaning. FREE pick-up and delivery! BUNDLE AND SAVE! Have your carpets and air ducts cleaned on the same visit and SAVE UP TO $50.00. Ask for details. 1. Refer a family member or friend to Budget King. 2. When they call to schedule an appointment, tell them to mention your name, that you referred them to us. Your file will be noted. 3. When you are ready to schedule your next appointment, give us your referral's name. 4. You will be rewarded with 10% of what your referral spends with us. This will either be in a "Budget Bucks" credit or CASH. Since we guarantee our services 100% or your money back, rest assured that your referrals will be given our best TLC treatment.